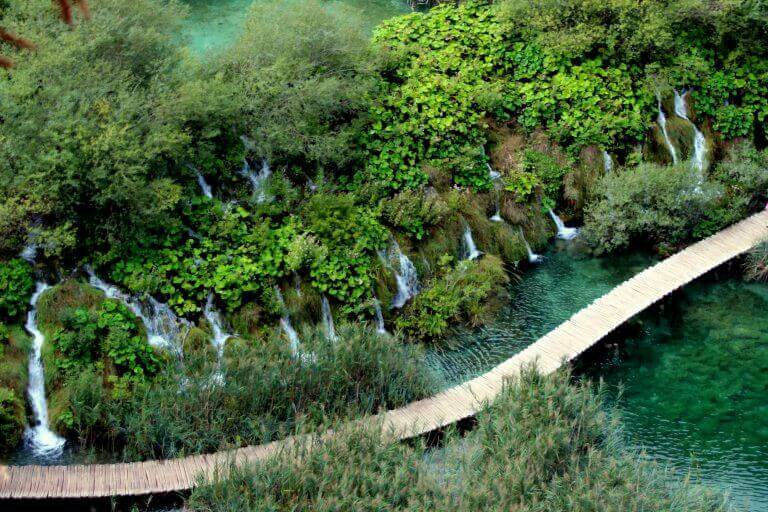 Plitvice Lakes National Park is incredibly beautiful, filled with many trails to explore and will blow you away with it’s natural beauty. 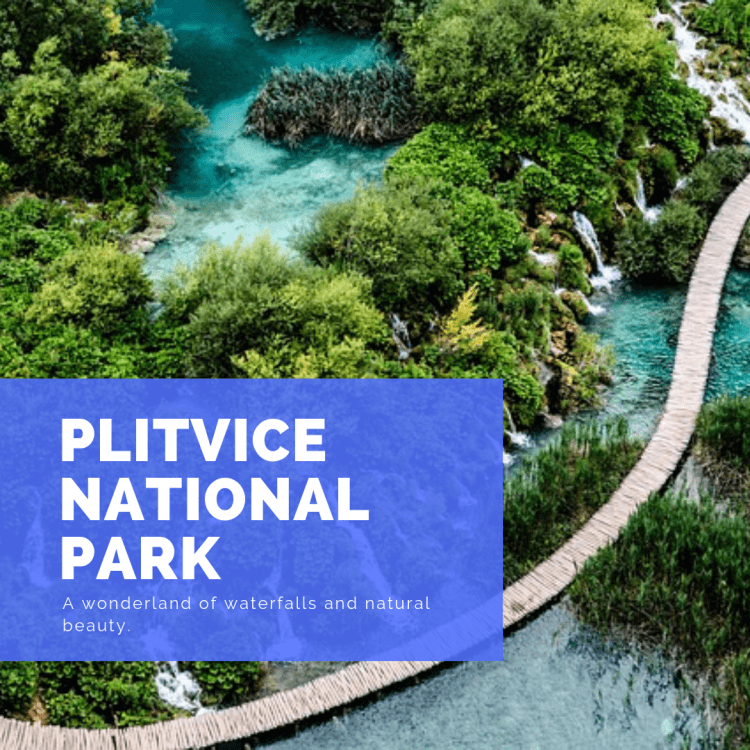 I’ll try to give you the Plitvice lakes best route to take, share the best Plitvice lakes maps to help guide you on the Plitvice trails and give you all of our insider tips! This guide should help you discover what to see and do to maximize your time within the park. We are frequent travelers of the “shoulder season” because we are NOT a fan of crowds. So that means visiting in the Spring and Fall. Avoid the peak of summer travel in July and August. 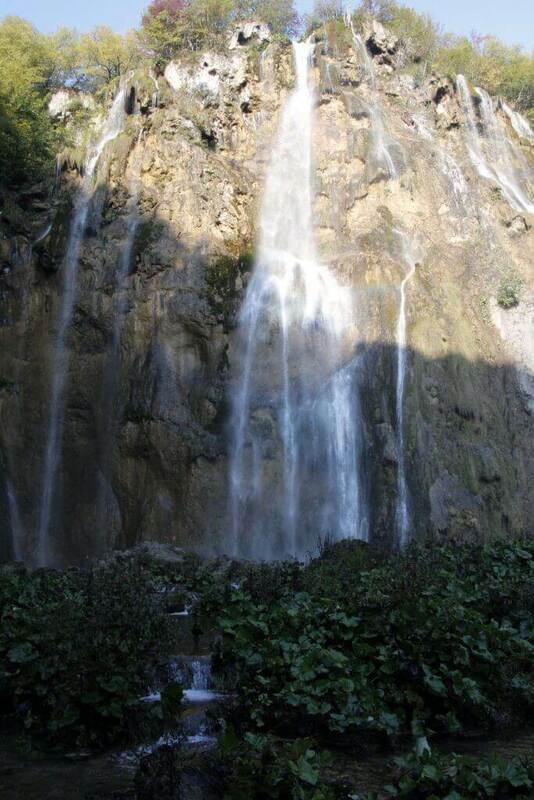 In Spring, the waterfalls are at full speed due to the extra water and melt from winter. 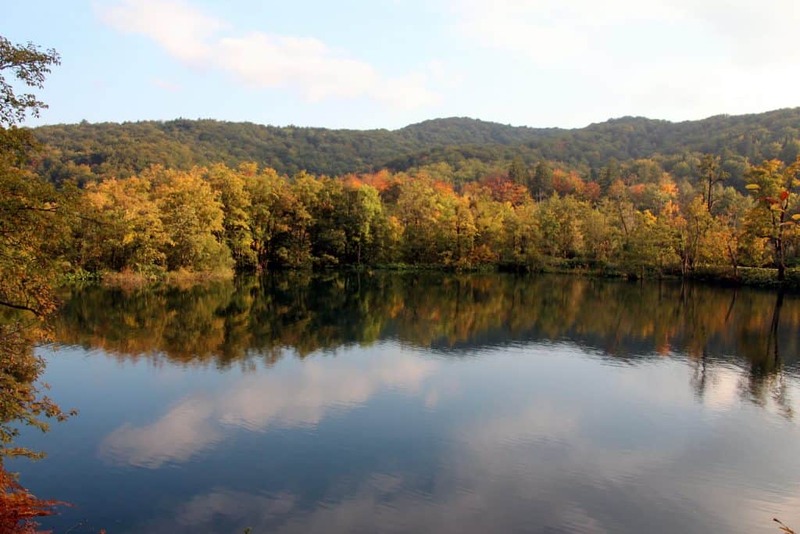 During the fall, the colorful leaves add to the beauty of the park. We decided to visit in October, so the Fall leaves were just beginning to turn. Check the website for the most up to date hours by season. I highly suggest spending the night in the area and not doing the trip from Split or Zadar. You’ll want to arrive early or later in the day to avoid tourist buses and crowds. Trust me, having the place to yourself really adds to the charm and you’ll be able to really soak up the beauty of the park. I know many visitors take a tour of the park, but that really limits your time and feeling rushed isn’t the best in this beautiful park. 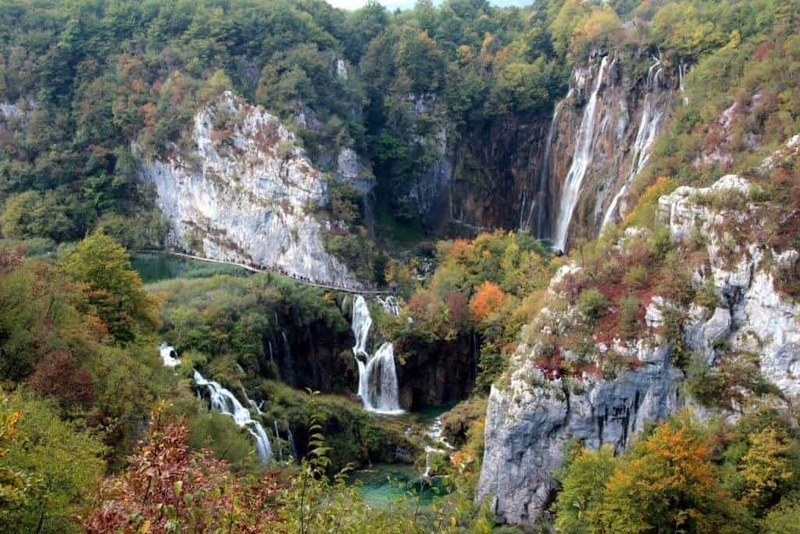 For us, Plitvice was a destination to enjoy, not just a “check the box” national park. 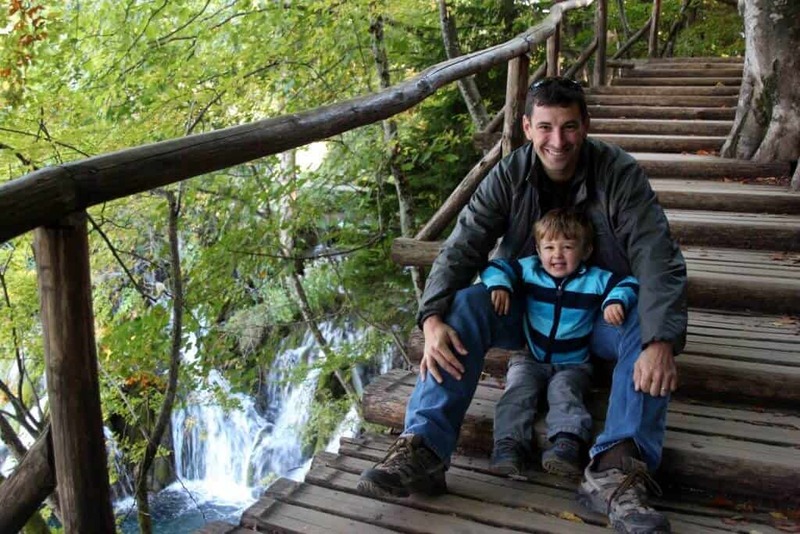 Plitvice Lakes National Park is NOT stroller friendly. Bring a carrier, they make them for toddlers and preschoolers. For older kids, take frequent breaks, keep the kids powered up with snacks/drinks and toss them on your shoulders to save their legs. We also play plenty of “eye spy” games, come up with silly activities and conversations to keep things interesting. There are two different entrances. They are marked Plitvice Entrance 1 and Plitvice Entrance 2. Entrance 1 is located at the lower lakes. Entrance 2 is located at the upper lakes. There is a small charge for parking your vehicle in the lots. Each parking zone has accessible restaurants/cafes, bathrooms and ticket offices. You can save time by buying your tickets ahead of time online or pre-purchasing them at your hotel/B&B, if they offer that service. We were staying locally at House Tina, so we purchased our two-day tickets before we arrived. Want to read more about House Tina? 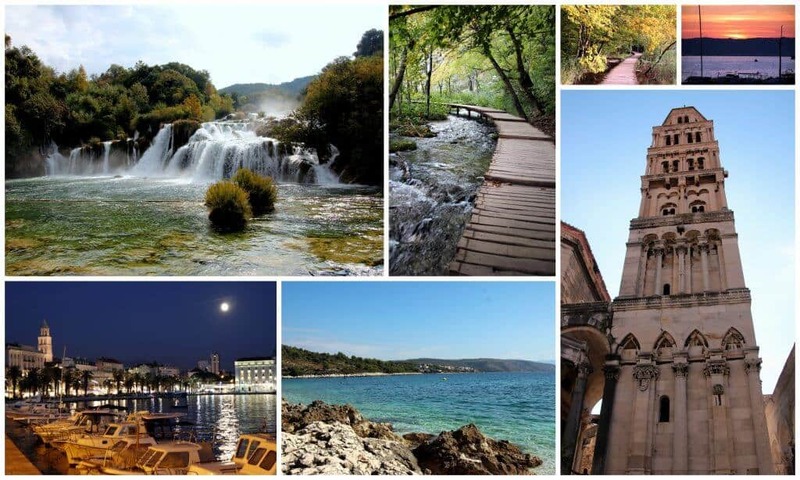 Head back to my Guide to Croatia post. 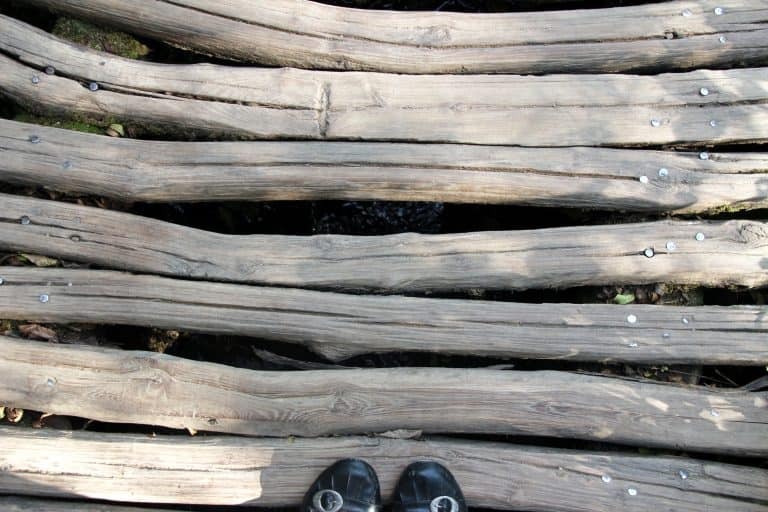 Once you’ve gathered your snacks, drinks and other necessary supplies, head over the bridge (crosses the main road) and down to the start of the trails. 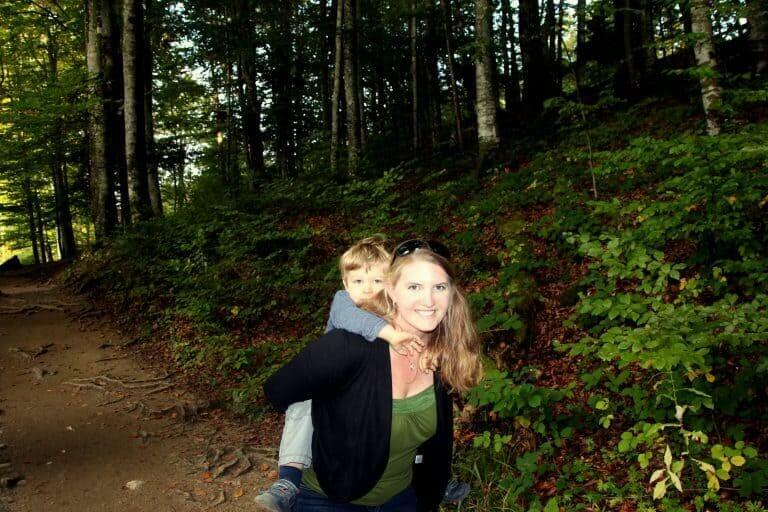 There are 8 different hiking options. Four at the upper lakes (parking lot 2) and four at the lower lakes (parking lot 1). The shortest trail is recommended to take 3 hours, while the longest trail can take up to 8 hours. 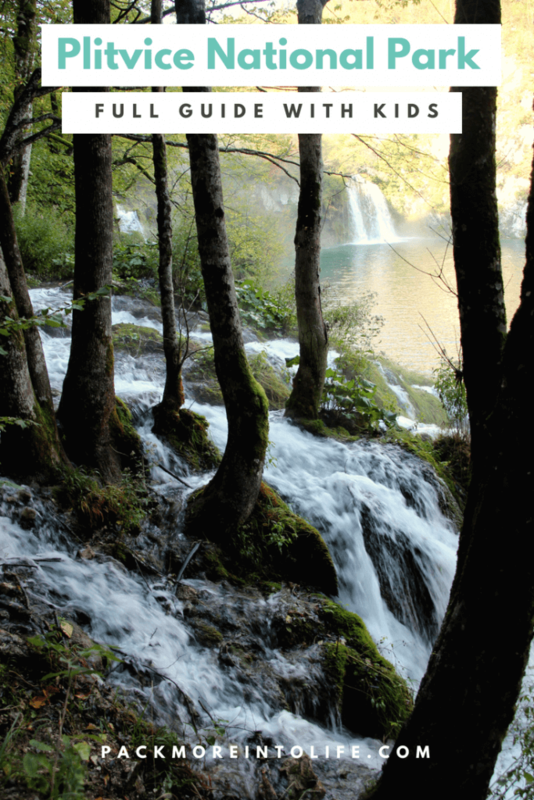 Trail A (2-3 hours – 3.5km – easy) lower lakes only as it starts and ends at Plitvice Lakes Entrance 1. 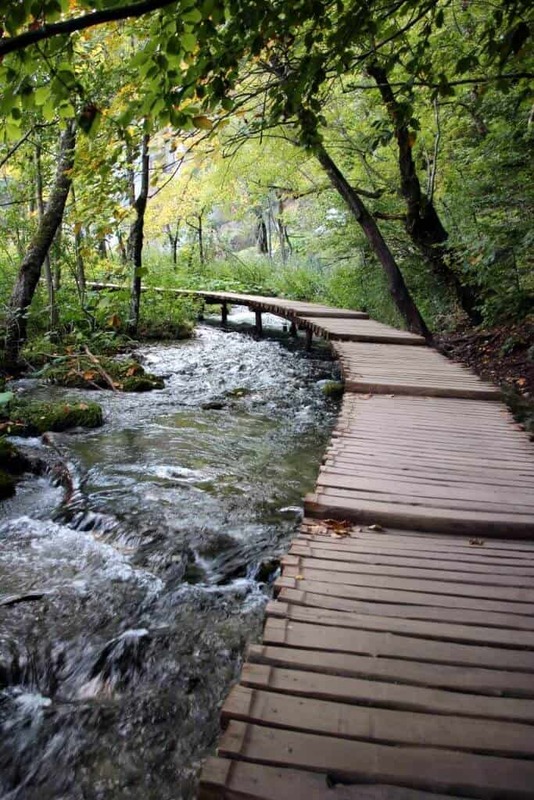 Walk to the Great Waterfall and to Kozjaka Bridge. 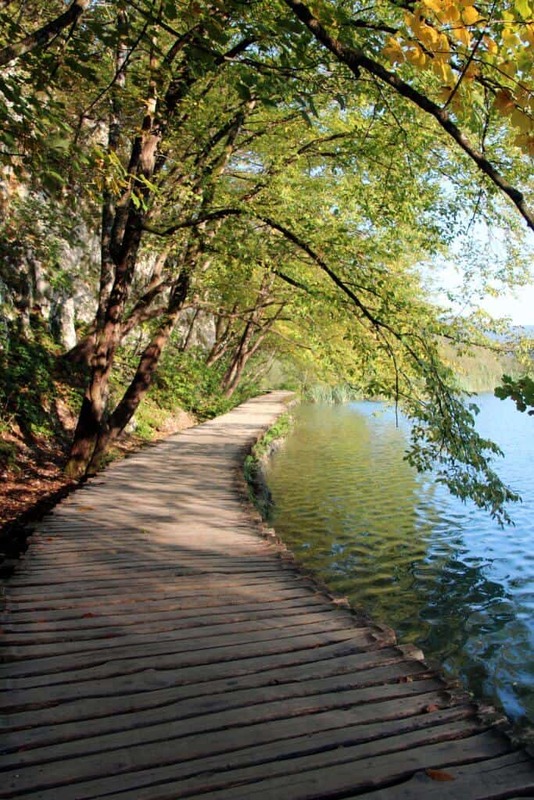 Trail B (3-4 hours -4km – easy) similar to Trail A but includes sailing on lake Kozjaka. Trail C (4-6 hours – 8km – moderate) extended Trail B including a visit to the upper lakes. 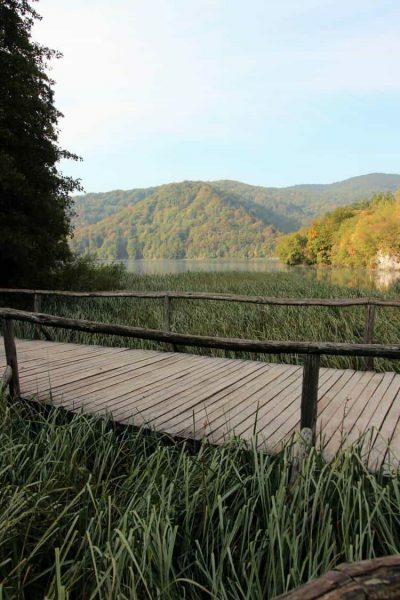 Trail E (2-3 hours – 5.2 km – easy) upper lakes to Proscansko Jezero starting with a short boat ride across the Kozjak Lake. 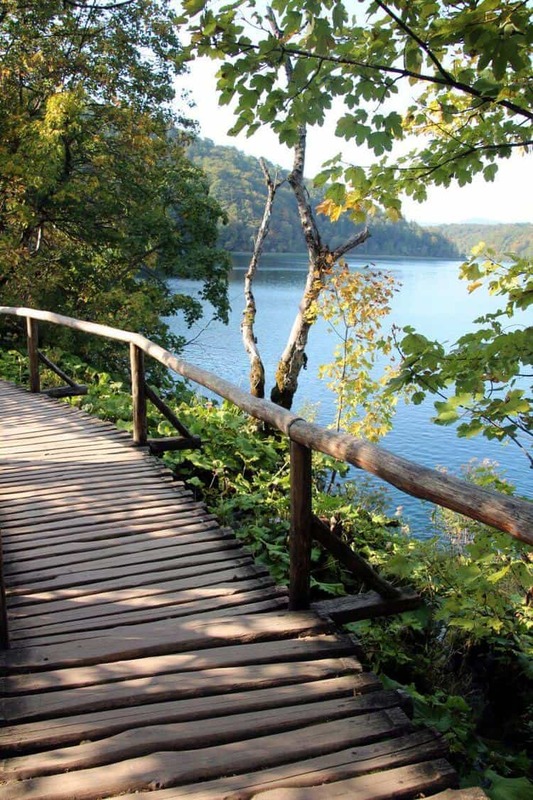 Trail H (4-6 hours – 8.9km – moderate) starts with a bus ride to your starting point, walk the upper lakes then sail across lake Kozjaka, to the lower lakes – take the shuttle bus back. Trail K-2 (6-8 hours – 18.3km -difficult) like Trail K-1 – explore the whole park. Whichever trail you choose, be sure to have food and drinks with you. 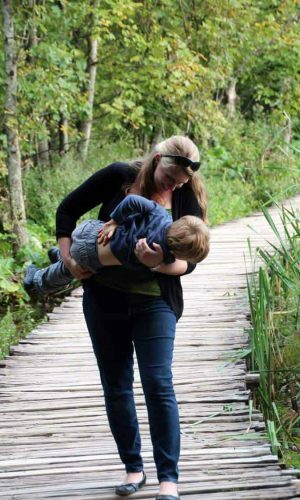 There are only a few services along certain sections of the trails and you’ll need your energy for the breathtaking views and bumpy wooden boardwalks. We suggest comfortable shoes, but we saw a variety of footwear. High heels would certainly give you a run for your money. Check out the boardwalk below! What trail did we choose on the first day? Trail E from parking lot 2! Check out some details about the trail here. It is a 2-3 hour hike covering 5.5 km (3.4 miles). Start down by the ferry boats. 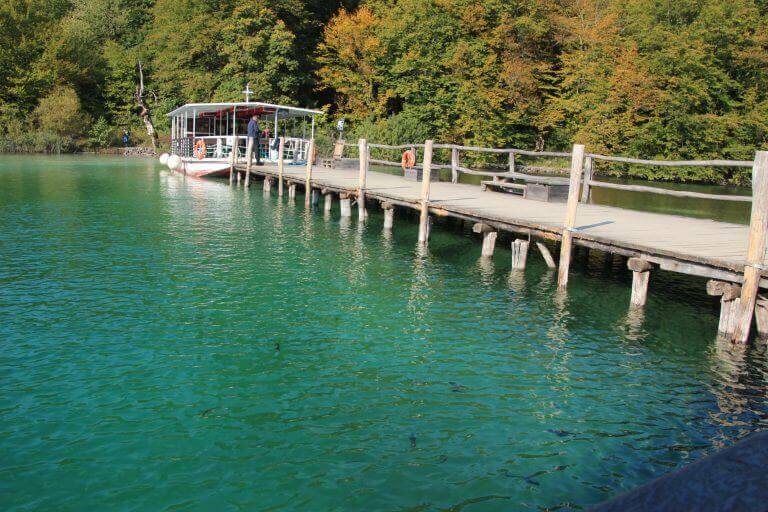 You’ll be amazed by the crystal clear water before you start the short journey across the lake. Ask the boat operator if you aren’t sure which direction it is headed, everyone is very helpful. Once you reach the other side, wait for everyone to debark. Once the crowd clears, begin your ascent up the stairs. This first section of the trail is absolutely gorgeous with waterfalls everywhere! You’ll follow the trails, please stay on the boardwalk and marked paths. 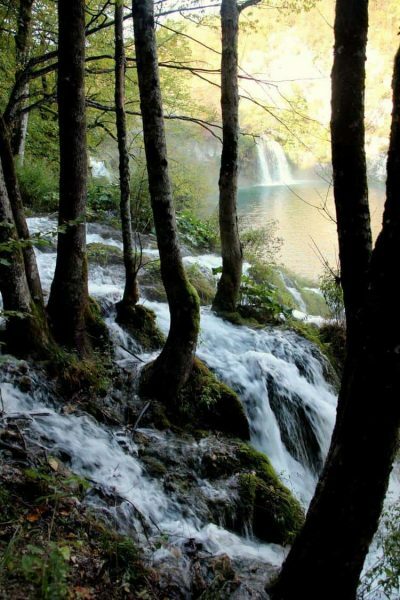 Plitvice Lakes National Park is a UNESCO World Heritage site for its natural beauty, waterfalls and limestone canyon. Please help to protect the park for generations to come! There aren’t any services along this trail along the upper lakes and we didn’t see any bathrooms either, so plan accordingly. 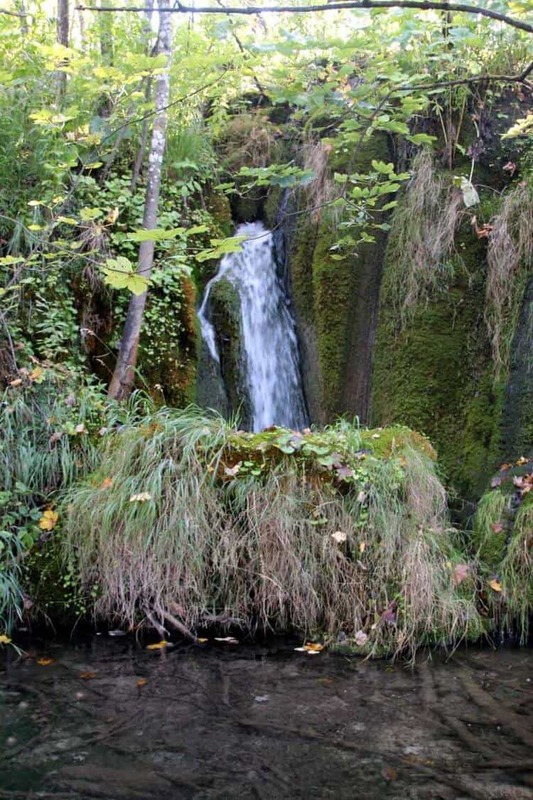 As you wander and explore, the lower portion of the trail features the large majority of the sites: waterfalls, crystal clear lakes, flora, and views. We are about 1/2 way done with the hike. As you head to the top of the upper lakes, you’ll head up through the forest to get a view over the top of the lakes. Our little guy was getting tired, so after a snack break, Dad put him “up top”. The trail actually leads below this viewing area, but we choose to head up to the right and around the top to meet the bus. It didn’t really add any additional time, but it did add to the total elevation. The bus pick up is well marked on the trail and we didn’t have to wait long. This is a “bus only” road and you won’t see many views on the way back down to the parking area. I’d say Day 1 was a success! We paid for hourly parking, headed back to our B&B and enjoyed a restful night. We decided to split up our visit in two days. This allowed us to complete the Upper Lakes and the Lower Lakes over two days. We were also able to do one section in the late afternoon and the other section in the early morning to avoid the crowds. If you have the time, I highly recommend this approach. What trail did we choose on the second day? Trail A from parking lot 1! Check out some details about the trail here. It is a 2-3 hour hike covering 3.5 km (2.2 miles). 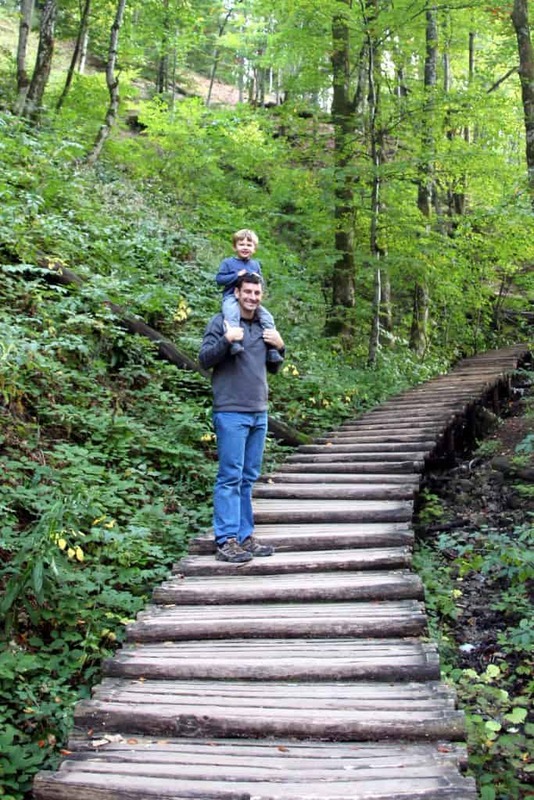 This is the most popular trail and the most crowded. Once you walk past the parking area (with various services), you descend down to the starting point of the trail. 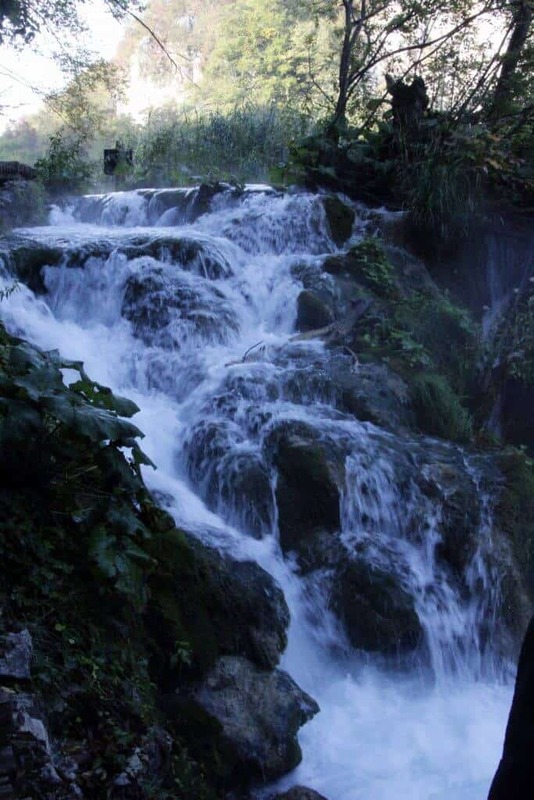 You’ll begin with amazing views over the canyon and you’ll be able to see the parks largest waterfall, Veliki slap at 78 meters high. We actually zoomed past the tourist to descend into the canyon (early bird gets the worm), but you can check out the view below. As you can see, the park trails are pretty empty. We were actually able to enjoy the waterfall without any company. As we left the waterfall, the crowds starting descending. We tried to keep up a quick pace to keep ahead of the other tourists, but it did rush us a bit. We finished the left side of the lakes and headed across the middle to find the restaurant/cafe for an early morning break. After our snack, we decided not to continue up and around, making a longer trail. Instead, we crossed back through the middle and ascended up and over our previous trails to get the views from above. Time to head up the trail and through the forest. There aren’t many views up this way, but I was looking for one photo shot that I saw when I was researching the trip. It took a bit of patience to capture an image without a single tourist, but I think it turned out beautifully! This was the end of our day 2 hike. We headed back up out of the canyon back to Entrance 1. It’s a long hike uphill, take breaks! Then you’ll have to continue up from Entrance 1 back to the parking area. 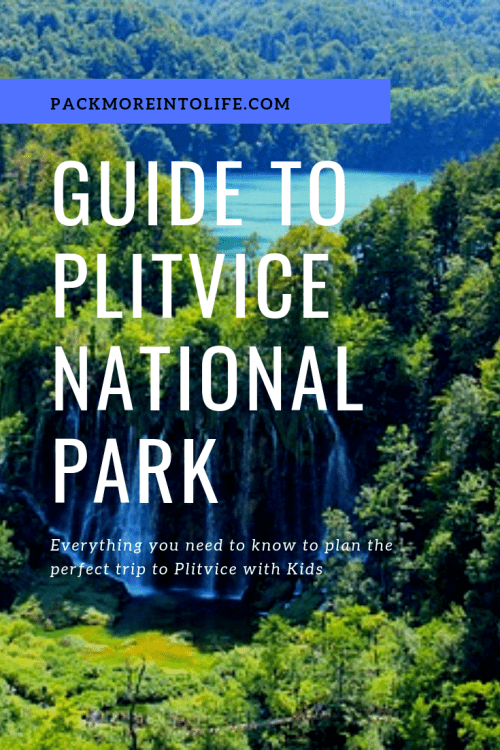 I hope this guide has given you a better idea of what to expect when you plan your trip to Plitvice National Park in Croatia. It is truly one of the most fascinating places we’ve ever been to and I highly recommend taking a full day or even two days to explore the park. Want to continue reading about our trip to Croatia? Click HERE to head back to my main post about our travels in Croatia. Or perhaps you are ready to visit many other European countries or even US destinations, check out my interactive map. Like this article? Save it for later on Pinterest with the images below!